GoDaddy Review | Is This Hosting Company Right For You? One of the most advertised web hosting company is GoDaddy. You see them everywhere. Using free promos, free domain names, and even models in their advertising. But are they are the right hosting company for your next site? 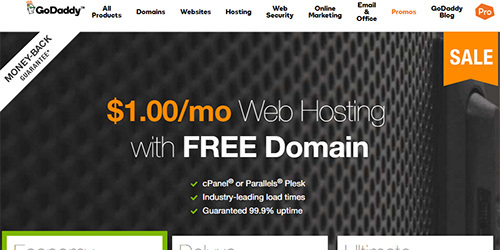 GoDaddy can be your next hosting provider and give you the tools to have a successful website. There are thousands of hosting companies, but here are a few advantages. GoDaddy offers great pricing and to new customers. But it doesn't stop there. There are always coupons scattered across the internet for all types of renewal deals. Linux hosting will be easy with cPanel or Plesk control panel. It has a full GUI layout to change all type of server settings, domains, or email addresses. If you still are having problems, you can use their 1-click installation service. This will automatically install some of the most popular web applications. Like WordPress, Drupal, Joomla, or the other 125+ apps. Take advantage of their award-winning security. They have a security team to monitor any suspicious activity. Using their 24/7 DDoS attack service at no additional charge. If you are running WordPress, Drupal, Magento, or any high resource content management systems. GoDaddy has plenty of resources to process those requests. With an average of .84 seconds a request, you visitors will not have to wait long to access your content. If you need more power, you request is only 1 click away. With their resources on-demand feature you can instantly get more CPU and/or RAM power. This requires no downtime for your website. With GoDaddy have more than 13 million customers you can see what their service has to offer. We swapped to Go Daddy 2 years ago for our email and webiste - we had a great deal price wise from them initially - a little costly on renewals but I dont mind paying extra as their customer service is above and beyond. The website builder is very easy to use and anyone would be able to navigate this. Never had any issues with hosting or emails etc. The team always call and check up on you and are so friendly. Pleasure to deal with! Victoria used GoDaddy to easily help her build a website by using the Website Builder. This requires no web development knowledge, just point, click, and save. By shopping at GoDaddy Alejandro was able to save some money. He took advantage of their special promotions. Getting great pricing on Linux web hosting and a free domain name. All including a management control panel. As they have great introductory prices, to take note that they will up the price when you renew. Renewal prices are around $8/month. They also advertise website backup, this is an additional charge. They are a massive company with a lot of customers. You may spend some time on the phone or chat to speak to someone. They do have great customer service, it just may take awhile. Always look for promotions or coupons when you are ready to purchase. They always have some type of sale running. Once you have you have your hosting account setup. Take full advantage of their services. Use the one click installation and use their support team. These can save a lot of your personal time. GoDaddy will give you the required performance, disc space, and bandwidth you need to get your website going. If you have little experience with web development. I would get GoDaddy to rely on their support team, 1 click installation, and website builder. GoDaddy.com is a good sites especially in India. It provides very cheap hosting service as well as a good assistance to the user. The space is enough for a website to get high traffic and survive online. As for the e-commerce, GoDaddy is good for it also. Many are satisfied including me.